Very worthwhile visiting is ‘Les Grottes de Thouzon’ in the neighboring village Le Thor. 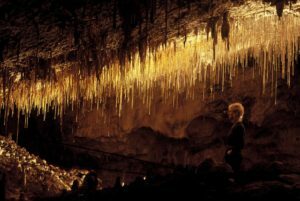 The natural cave is easy to access and has astonishing stalactites. The cave was discovered in 1902 and is the only accessible cave for tourists in the Provence. During a 45 minute tour you will be able to walk along the fossil bed of an ancient underground river, and discover the richness and diversity of this cave and eco-museum.